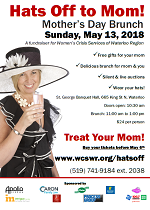 A fundraising brunch for Women’s Crisis Services of Waterloo Region, Anselma House and Haven House. Treat your mom while helping our moms. Your financial support helps women and their children in Waterloo Region to leave their abusers and move beyond violence. Bring the whole family and come out for a delicious brunch and a fun time at the beautiful St. George Banquet Hall in Waterloo. Place a bid on a silent auction item. take part in the live auction. Honour your mom, while helping our moms. Want to help us promote this worthwhile event? Want to donate an item to our live auction, silent auction or gift bag, or sponsor this event? Learn more. Treat Your Mom! Wear your hats! You must buy your tickets before May 6th.